Cuisinart is known for making stylish, high-performance coffee makers. 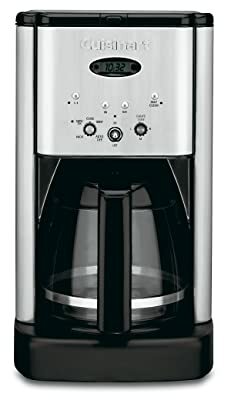 Their new product, the DCC-1200 Brew Central 12-Cup Programmable Coffeemaker proves to be a great coffee maker, which is well-designed, inexpensive and durable. It comes with a brushed metal finish that gives it a retro look. Made from durable materials, this machine can prepare excellent coffee every morning for many years. Its classic design and high tech features make it a perfect companion for any modern kitchen. Some of the advanced features in the Brew Central coffee maker are its self-cleaning function, automatic shut-off mechanism and a beep sound which signals the end of the brew cycle. The highlight of the product is its programmable digital clock, which helps, you can set the brew 24 hours in advance. The minimalist exterior design of the Cuisinart DCC-1200 inspired by the retro fashion not only makes anyone like it instantly, but also helps the machine blend in perfectly with any kitchen theme. With its perfect brushed-chrome appearance, there is no doubt that this coffee maker can make your kitchen look complete. Unlike some low-end coffee makers, which have sophisticated control settings that waste your kitchen time, the DCC 1200 has simple, user-friendly controls which make the machine ultra-easy to operate. All you have to do is to set the temperature and time controls after which you may indulge in other kitchen activities; your coffee gets ready on its own. This machine frees you from the hassle of running around it while you are already busy in the morning. Do you have to make coffee for an entire family? The Cuisinart DCC 1200 makes more than enough coffee for a large household. Each time, it can make over 12 servings. You may also invite some friends, and no one has to wait for another round of brewing. Say goodbye to the days when you were alone in your coffee break. If you are worried about the aftermath, be assured that you can pull it off with little effort. The components of the Cuisinart DCC-1200 are detachable and dishwasher safe. This unit also has a self-cleaning mechanism. The best part is that you will find a red light indicator glowing whenever the coffee maker needs a cleaning. 1. The reservoir cover can be flipped back easily for filling water. Before this process, it is recommended to check the carafe height markings so that you add sufficient quantity of water. This helps you know the exact amount needed to compensate for the water used for wetting the grounds and lost as steam. 2. The Showerhead sprinkles the water evenly over the coffee to minimize the loss of temperature while the water passes through the grounds. 3. The Cuisinart DCC-1200 is equipped with a charcoal water filter that removes calcium, chlorine and any bad taste or odor from the tap water. It is recommended that you change the water filter after using it for 60 times or a period of 60 days. You may have to change it more frequently in case you use hard water. 4. The LCD digital clock on the front side shows the time; you will use it for setting the time while accessing the automatic features. The flip switch and the function knob are used to program several automatic functions. 5. The Auto On and Auto Off features can be used to start the brew cycle and turn off the coffee maker anytime within 4 hours, respectively. The detailed instructions to use these two functions can be found in the Instruction Manual under the section ‘To program the Variable Auto Off’. 6. The Heater Plate Control Knob is used to control the coffee’s temperature after the brewing cycle is completed. It has three temperature levels – high, medium and low. It is not always recommended to use the high setting because after crossing a temperature of 185 degrees Fahrenheit, the coffee gets burnt slightly and tastes bitter. 7. The 1-4 cup setting comes handy while making small amounts of coffee. Ordinary coffee makers cannot make one or two cups of sufficiently hot coffee as their heaters do not warm up enough to heat the small quantity. However, the 1-4 setting in the DCC-1200 Brew Central makes the water double heated so that a single cup of coffee can be as hot as a full pot. To access this function, just press the 1-4 button on the control panel soon after you power on the unit. 8. The Clean Setting indicates when you need to clean the unit. All you have to do is to remove the layers of calcification inside the water reservoir. Doing this regularly prolongs the unit’s life. 9. The Brew Pause mechanism aborts the coffee flow from the basket (for 30 seconds) when you remove the carafe from the heater plate. So, you may enjoy a cup of coffee in the middle of the brewing process. But, the coffee at the beginning or in the middle of the brewing cycle has a different flavor when compared to the coffee collected at the end of the cycle. 10. The glass carafe comes with an ergonomic handle that helps you to pour coffee with zero dripping. Also, there are markings on the carafe indicating from 2 to 12 cups. 11. The heating plate is made of premium materials. It has a black non-stick coating on the surface and is scratch resistant. 12. At the end of every brew cycle, the Ready Tone signals you with 5 beep tones. After the tone, coffee continues to stream for some seconds from the filter. The Brew Central™ 12-Cup Programmable Coffeemaker can be bought online for around $$. For the excellent features it comes with, it is aptly priced. Also, the product is quite light at 6.8 pounds, and the dimensions of the unit are 10.8 x 9.6 x 15.6 inches, which show that it is quite compact and does not take much of your kitchen space. Whether you are a homemaker or a working individual, the Cuisinart DCC-1200 is the ideal coffee maker, you need to make a perfect coffee for your entire family.